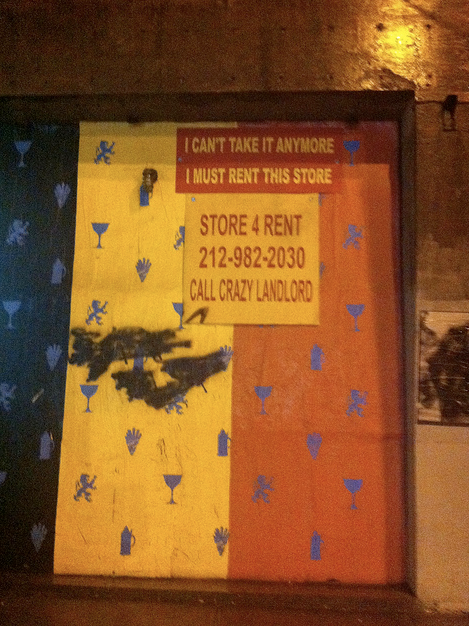 EV Grieve: 'Crazy Landlord' back to being crazy! 'Crazy Landlord' back to being crazy! Nearly two years have passed since we first noted the "crazy landlord" sign on the long-dormant corner of Second Avenue and Third Street. The large french doors will open to a wraparound sidewalk cafe sitting 40 or so under large colorful awnings. It will be romantic yet appropriate. Think a sexier Balthazar marries a corpulent Fette Sau and the offspring is The Belgian. We've lost track of those plans. The corner has seemingly been quiet in recent months... And now, as this photo taken by EV Grieve reader Salim shows, the corner space is apparently back on the market. And the landlord just take it anymore! I'd rather have crazy landlord than his far too common counterpart 'prick landlord'. I was intrigued by the (presumable) landlord's comment on that earlier post, noting the history of the space, his attitude towards local politics, and that he was specifically looking for something adventurous, culturally worthwhile, etc. to fill that space. The Belgian did not seem likely to fulfill that promise. Hope something more in line with that earlier vision comes along this time. He shall be hearing from my attorney! Funny to see the return of Crazy. I've heard several times there are major structural issues with this space. I wonder if that's the problem and if it will ever be inhabitable. i know this guy and he isn't so crazy. as a landlord he was pretty decent about repairs, heat and stuff. he cares about the neighborhood and what kind of store will be in his building. the building looks like a concrete bunker because there were structural problems that no longer exist. That guy is begging to be prank called from a drunken me at Mars bar. Because now I can't TAKE IT ANYMORE! You know...this guy is the "landlord" of Imperial Tavern,Diablo Royale & Drop-off. He doesn't own the buildings...just the leases.